This morning Dave made lightly smoked kippers with soft boiled eggs for breakfast. We then headed off for Talbenny and took a very short walk at St. Brides (Sain Ffred / Ffraid). On our way to Marloes we were asked to detour as the farmer was moving some cattle down the road. 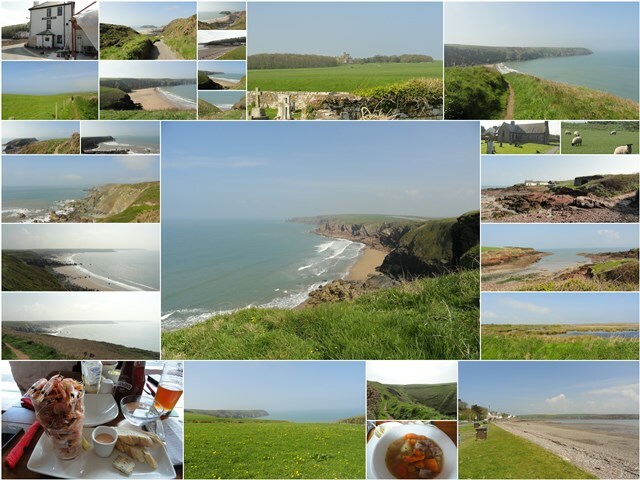 We drove through Marloes to Martin’s Haven and then went for a 50 minute cliff path walk from Marloes Mere to Marloes Sands. The views are amazing! We drove to our next walk, the other side of Marloes and walked 20 minutes to Musselwick Sands. Back in the car, through Dale to St. Ann’s Head and back to Dale for lunch. We went to Griffin Inn and I had a half pint of Stowford Press Cider and Dave had a pint of Buckley’s Bitter and a pint of prawns (£7.25). I had cawl (pronounced cowl) which is lamb broth (£6.25). After lunch we drove through Milford Haven (Aberdaugleddau) to Hazelbeach looking for Claws seafood. We found the delivery van and the house, but no one was answering the phone. We drove back to Milford Haven and around the harbour before stopping at Tesco’s to do some shopping. We then went to Broad haven and had ice creams from Upton Farm – salted caramel for Dave and Merlin’s Magic for me. We ate these while walking on the beach. We then took a drive to Walton West to find Dash seafood – but they only sell wholesale. Seems like finding a fishmonger here is not that easy. We returned to Little Haven and went to The Castle for our evening drink. I had a cider that was 7.2% – I had to be warned. This is less than the beers we enjoy at Triggerfish. Dave had a half pint of bitter and then we walked back to the apartment to relax. We shared a bottle of Wyld Wood organic cider – Dave used some for the leek and bacon we ate with dinner. Dinner was a pork festival – sausages, chops and black pudding! Followed by a bit of chocolate, then kiwi fruit with cream, and crackers and cheese. Wine tonight was Hardys Shiraz Cabernet 2013 – an Aussie wine! All the fresh air meant an early night. After breakfast of fried eggs, bacon and mushrooms we went for a walk to the point. We stopped at The Saint Bride’s Inn for coffee and barra brith. The owner asked where we were from and Dave told her Cape Town as its the biggest city closest to where we live and therefore the most likely of places people will know. She then said ‘oh, our daughter in law’s family is from Gordons Bay’. What a coincidence. And we know them! The world is a small place. 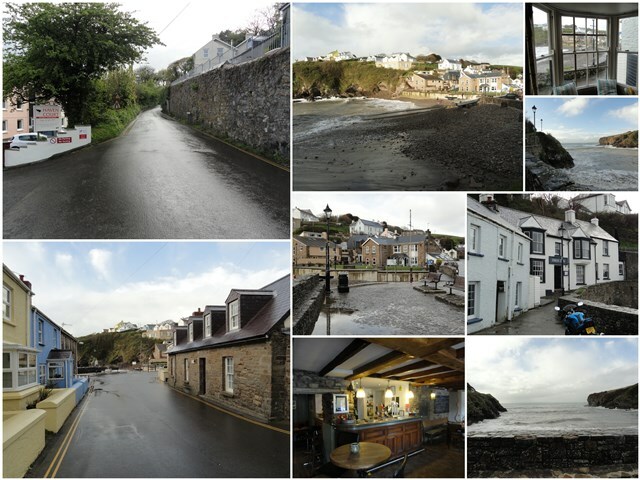 We came back to the apartment and Robin, the manager gave us a talk on Pembrokeshire. We tried Welsh cakes while he told us about the places to see. The economy here relies on farming, oil refinery and tourism, with a total of 3 million people visiting the area a year. In contrast, Cape Town gets 6 million holiday makers in December alone. After the talk we took a drive on mostly single lane roads to Solva (Solfach), St. David’s (Dinas Tyddewi) and on to Rosebush. We stopped just outside of Rosebush at Lodor Fach which is a working farm and bought some pork chops. We then went to Tafarn Sinc for lunch. This is the highest pub in Pembrokeshire at 266.6m above sea level. The place was built in 1876 and is worth a visit, even if only for a drink. Dave had Cwrw, a local beer and I had cider. We chose to stay for Sunday lunch £13.95 a head). I had the (well done) roast sirloin of mature Welsh beef and Dave had the roast loin of pork, with stuffing and crackling. Both were served with Yorkshire puddings, roast potatoes, mashed potatoes, boiled cabbage, carrots and mushy peas. The vegetables and gravy were served on the side. I had the best ever horseradish sauce I’ve tasted. Dessert for Dave was fruit pie and for me was lemon crunch (cheese cake) – both served with cream. 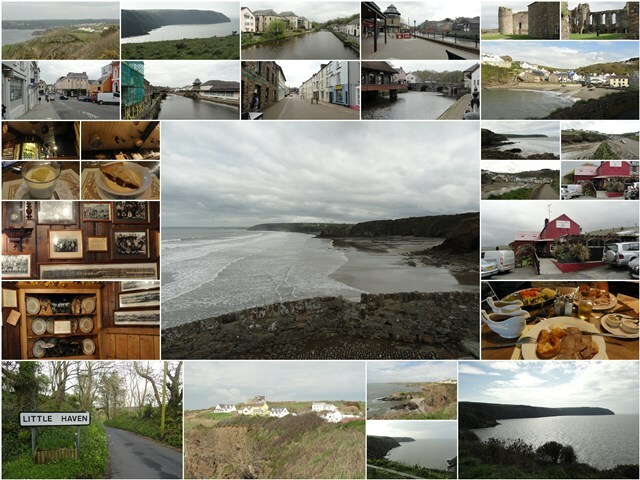 After coffee (for Dave) and tea, we headed to Haverfordwest. We parked the car and walked around the Riverside shops which are closing down so that they can build a cineplex. After that we drove to the Castle and took a brief look before getting to Tesco’s just before they closed for some cream. We came back to Little Haven and went for a walk along the cliffs. The signs tell you to beware of the steep drop and that if you fall you will die! This is so funny as you cannot open the windows fully in our apartment because of Health and Safety but you can walk along the cliff paths with no railing. We came back along the road and stopped at The Swan Inn for an ale and a cider. Dave made lamb chops for dinner with a mushroom sauce and asparagus. The wine we had over two nights was Dino Romagna DOC San Giovese 2012. Dessert was strawberries and cream and a piece of mint chocolate. Cheese and crackers to snack on before heading for bed. I woke up at 5:50 after a good night’s sleep and snoozed before Dave woke up at 6:40. I then went to make us coffee and Dave had a shower. By the time he went downstairs Anne and Stuart were awake and I joined them after my shower. Stuart made use bacon and eggs for breakfast with fried mushrooms and toast. Another cup of coffee and then it was time to say goodbye sadly. We left Abingdon (the oldest continuously inhabited place in England) and drove past an adult establishment named the Spread Eagle! We went over a 5p toll bridgebefore driving through the Cotswalds. We stopped at the Kings Head Inn in Birdwood for espresso and past a road called Solomons Tump. After Ross on Wye we started seeing Welsh names and crossed the ‘border’ at 11h52. We drove past Raglan (Rhaglan) Castle before arriving in Swansea (Abertawe) where we went to the Swansea Market for lunch of sausage rolls. We also bought leeks, scallops on the shell, mackerel, lamb chops and sausages from the various food stalls. We topped up our new sim card with international airtime and then headed for Haverfordwest (Hwlffordd). There is a HUGE Tesco’s here and we did the rest of our shopping before driving to Little Haven. After unpacking I called my dad for his birthday and then we took a walk into the village to the Swan Inn. We watched the wild waves while having a drink. A half pint of ale and then bitter for Dave and a half pint of cider for me. The sand bags are still lined up along the footpath! For starters we had the scallops and our main course was mackerel with leeks and samphire. This is one vegetable I dont’t need to try again. Dessert was strawberries and cream and after cheese and biscuits I decided an early night was in order. Breakfast was no better, with my poached egg now 2 days old! Thankfully Claudia, one of the air stewards was most helpful and made Dave and I coffee! That was a great way to wake up. Our luggage was delayed coming off the plane but once we had that we could go and sort out a new sim card as our Vodafone one is sitting at home! 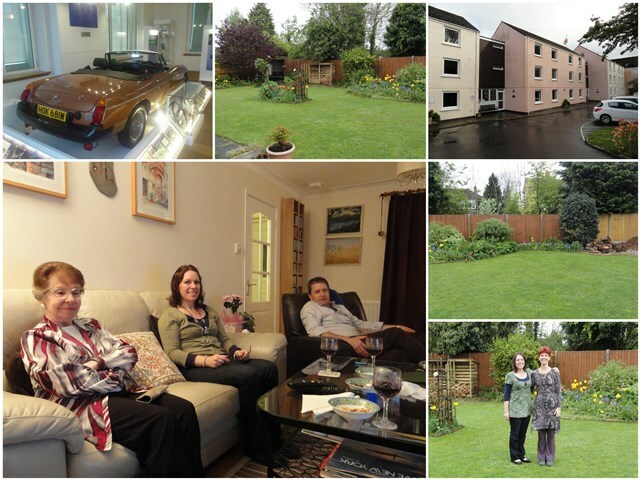 We collected a 4 door diesel Kia from Europcar and headed from Heathrow Maidenhead on the M4. We then changed direction to Cookham and drove through Cookham looking for a specific house. We then went on our way to Marlow on stunning narrow country roads. We crossed an amazing bridge into Marlow. We then headed to Henley on Thames and after driving through we then stopped in Nettlebed at the White Hart Hotel for coffee. We crossed the Wallingford bridge into the old town before arriving at Anne in Abingdon. After having coffee with Anne and Evie, and a shower Dave, Anne and I went to Millets farm stall where we bought asparagus, Jerusalem artichoke and rhubarb for dinner. We then went to a quaint pub called Rose Revived for lunch. Anne and I had cider and Dave had Abbot Ale. For lunch Anne and I chose pulled pork wraps and soup which I think was chicken. Dave had a BLT on multigrain which came with tomato soup. After lunch we went into Abingdon and walked past St. Helen’s church and the alms houses. Sadly it was raining and there are no photographs. We then went to the museum which was really interesting and includes the last MG to ever be made in Abingdon. We came back to Anne and relaxed with coffee and yummy biscuits Dave found at Millets. We took a look at the river behind the house and I found one of the 5 Easter eggs still missing from the hunt last weekend. Evie took me to see her house which is perfect! Then it was time to prepare dinner. We had roast chicken with honey roasted parsnips. A potato and houlimi bake I am going to try at home as well as artichoke puree which was divine. I love the vegetable and will look for some seeds. I pan fried the asparagus and made a rich gravy. We had Vergenoegd wine with dinner and an apple and rhubarb crumble for dessert served with clotted cream and custard! Dave showed Anne, Stuart and Evie some photos from home and after more wine it was time for bed. We had a truly brilliant evening! Yesterday everything that could go wrong did! We had an attempted break in at work at 5:45 which meant Dave had to go to work very early. Thankfully our guys at work could put the glass back in themselves as it had been very carefully removed. This is the third time but now we have a beam facing downwards which set off the alarm. The frame has been rivetted in so hopefully this will deter a repeat attempt. No sooner had this been sorted out than disaster struck at home. The company delivering stone had a brake failure on their truck which took down the wall and gate and fence. Thankfully our builder was available and he came over and bricked up a new column himself, using his foreman as an assistant and our gardener as his labourer. The gate was put back in place, albeit it off its track for the night and today the gate will be placed back on the track. It will however need replacing, together with the motor. A blessing in disguise as I really did not like the gate at all! Last night we packed and this morning we got gate keys to both the boys who are house sitting for us. We got to the airport and faced a short but slow queue to check in for our flight to Joburg. The flight left half an hour late and we experienced a lot of turbulence. The meal I was served was fantastic. Cous cous salad starter. Chicken roulade and steamed vegetables as a main and a carob based florentine for dessert which was divine. Dave had pasta with meatballs which looked great. We landed safely, collected our luggage and were offered free bag wrapping from SAA which is part of their service for Premium clients. We are now sitting in the SAA premium lounge relaxing before our flight which leaves at 8pm tonight. The showers are great in this lounge and Dave and I had a bit to eat before boarding our flight. The meal on the plane was not good. The dishes were premade days in advance and the only fresh item was Dave’s dessert which was dry! My steak was good and made a welcome change from fish. Both Dave and I managed to sleep but the plane was extremely cold. This year Dave and I will be visiting England and Wales from the 24th of April to the 6th of May. I hope that you enjoy following us on our journey.